The next upcoming St. Patrick's Day is on Tuesday March 17th, 2020. St. Patrick's Day or the Feast of St. Patrick is observed on March 17 as a religious and cultural celebration. It honors Ireland's patron St. Patrick. The date marks the traditional death of the saint. In the early 17th century, it was made an official Christian feast day observed by the Church of Ireland, the Catholic Church, the Eastern Orthodox Church, and Lutheran Church. The day honors Saint Patrick and Christianity in Ireland. It also celebrates the culture and heritage of the Irish population. 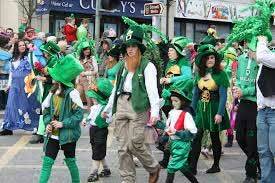 People wear green attire and attend parades and festivals. Church services are attended. Restrictions on drinking alcohol and eating are lifted on this day. This led to its propagating tradition of alcohol consumption. Irish food and parties are celebrated in pubs. Water was even dyed green in the Chicago River in 2005. Symbols include the shamrock, anything green, Irish beer, and the leprechaun. Saint Patrick was believed to be born in the fourth century in Roman Britain to a wealthy family. At age 16, he was kidnapped and taken as a slave to Gaelic Ireland. There, working as a shepherd, he "found God." Patrick found his way home and eventually became a Christian missionary and bishop. He returned to Ireland to convert the people to Christianity. He died March 17. He became Ireland's prominent saint.